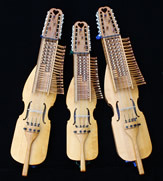 Earl has a PowerPoint presentation developed on the history and current playing of the Nyckelharpa. This presentation runs 30 to 45 minutes. He will bring at least one instrument along and provide a basic introduction to the instrument. This presentation is intended for general audiences. Presentations have been given to a University of Wisconsin - Eau Claire Folk Music class in 2013, at the Minnesota Bluegrass and Old-Time Music Association Harvest Jam in 2014, the annual mid-west Scandinavian club at Beaver Creek Reserve and at the Birdhouse Center for the Arts in 2015, the Eau Claire Sons of Norway in 2016. Future presentations are scheduled for late July / early August of 2016 are listed on our calendar page. The presentation can be customized for other audiences as needed.